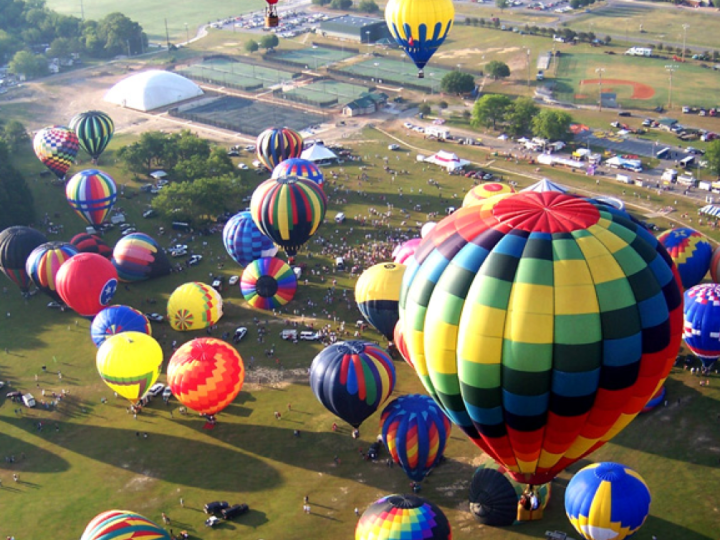 Annual Alabama Jubilee Hot-Air Balloon Classic returns to Point Mallard Park May 25-26. Decatur, Ala. – More than 60 big beautiful hot-air balloons will fill the sky above Decatur, Ala., the last weekend in May during the annual Alabama Jubilee Hot-Air Balloon Classic. The colorful festival, set for May 25-26, 2019, at Point Mallard Park, features hot air balloons, live music, a balloon glow, antique cars and tractors, arts and crafts, fireworks, other family fun with activities on the ground and in the air. The Alabama Jubilee Hot Air Balloon Classic has become a Memorial Day weekend tradition for many families for more than 40 years. The celebration begins bright and early Saturday, May 25, at 6:15 a.m., with the hound and hare balloon race; one balloon flies off the Jubilee field and the others try to follow to see which pilot can get closest to a target put down by the hare balloon. Some of the activities to be held throughout the day on Saturday include an auto expo from 8:30 a.m. to 3 p.m., behind the Ice Complex and the popular Decatur Art Guild arts and crafts show from 7 a.m. to 7 p.m. in the pavilion. The Southland Flywheelers will host an antique tractor show, featuring some of the best restored and maintained tractors in the Southeast, from 8 a.m. to 2 p.m. A tractor parade follows at 10 a.m., and at 11 a.m., there will be tractor games and a pedal tractor park opens for kids 6 years old and under. An afternoon hot-air balloon flight is set for 5:15 p.m. and at 8:15 p.m., the Balloon Glow is a must see as towering balloons of all colors light up Point Mallard Park. Musical acts on Saturday include Strangers with Friends at 5:30 p.m. followed by Bishop Black at 7 p.m.
Another round of friendly competition between the hot-air balloon pilots is scheduled for Sunday, May 26, with the Lynn Layton Key Grab. Balloons should start flying into the Jubilee field starting about 7 a.m. The Decatur Art Guild arts and crafts show reopens from 8 a.m. to 6 p.m., offering festivalgoers plenty of time to shop for handmade items in between the balloon activities. Another fun flight is set to launch about 6:30 p.m.
Sunday’s entertainment line-up will have Entice from Nashville performing at 7 p.m. and the two-day event concludes with the Alabama Jubilee Fireworks Spectacular at 9:30 p.m. Admission to the Alabama Jubilee is free. Free parking will be available at the G.E. parking lot at 2328 Point Mallard Drive SE and in downtown Decatur, mainly across from the Morgan County Courthouse at 302 Lee Street NE (shuttle pickup for this location will be at the Princess Theatre at 112 Second Avenue NE) with shuttle service to Point Mallard Park from 3 p.m. until 11 p.m. Saturday and Sunday for only $2 per person, each way. Please note all balloon activities are weather permitting. Balloons do not fly, tether or glow in the rain or if wind on the ground is stronger than about 8 mph or if there are thunderstorms nearby. During the Alabama Jubilee, Point Mallard Park is a “No-Drone Zone” according to FAA regulations. Blankets and lawn chairs are encouraged. For safety reasons, pets are strongly discouraged due to the loud noise caused by the balloons and the large number of people present. All activities take place inside Point Mallard Park, a 750-acre municipal park providing year-round recreation facilities in Decatur, Ala. For more information and a schedule of events, please visit www.alabamajubilee.net.